September Birth Flower | What is your birth flower? You’ve probably heard of birthstones, but did you know you have birth flowers, depending on the month in which you were born? 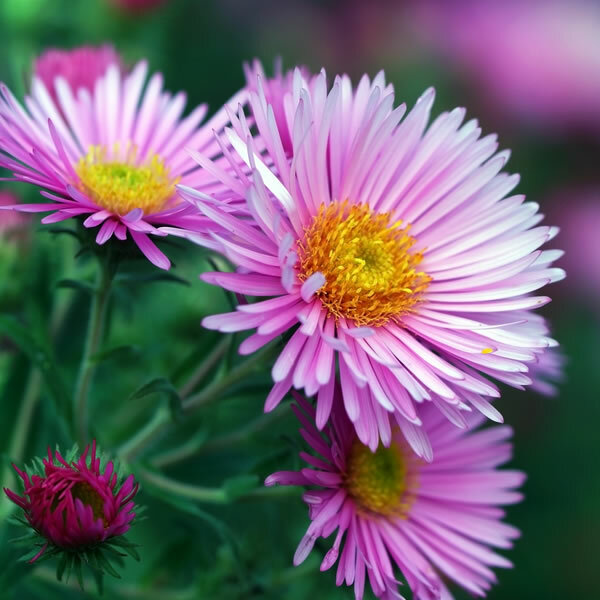 The aster is the flower most commonly associated with September. Most asters bloom in the autumn, which is why they’re a September birth flower. There are around 180 species, mostly originating in Eurasia: only one, the sea aster, is native to the UK. Many have big, colourful flowers, making them popular for growing and cutting. Their name is the ancient Greek word for star, because of their flower shape, and was given to them by the famous eighteenth-century botanist Carl von Linnaeus. One of the most widely seen asters in the UK is the common Michaelmas daisy, Aster x salignus. Sometimes it seems as though half of Britain’s gardens contain these cheerful pink or purple perennials, and they often escape into the wild, where they can be invasive. Asters are a popular feature of bouquets, with their rich variety of reds, blues, purples, whites, and pinks. As a September birth flower, they’re traditionally associated with love, elegance, and faith. eFlorist offers birthday bouquets that will fill your loved one’s home with colour and fragrance.